Yesterday on Instagram, we announced that we’re having a baby…and that the pickle cravings are real. Oh, yes. My cravings for anything salty and vinegary were one of the first signs I was pregnant! They are truly next level, to the point where your day becomes a mission to fully satisfy the desire. Fortunately, we live near Main Street Brewing and they sell big, amazing, juicy pickles at their growler counter. We are regulars. 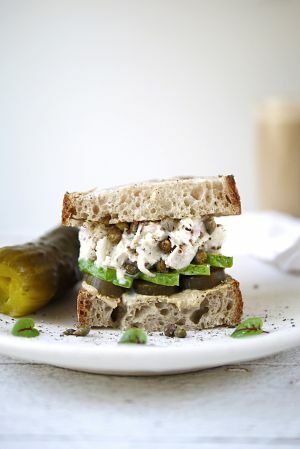 I’ve been adding vinegar, pickles and capers to everything I eat, including this ridiculously delish vegan tuna salad sandwich made with jackfruit. Let’s call it, “the ultimate pregnant girl sandwich”. I hope you love it as much as I do, even if you’re not pregnant! Add drained jackfruit to a medium bowl and remove excess liquid by patting them with a clean cloth or paper towel. You want it as dry as possible. Using a fork and knife, roughly chop / tear apart jackfruit into smaller pieces (as you might with tuna). Next, add mayo, capers, 1/2 tsp of the dijon and salt & pepper and stir to combine. 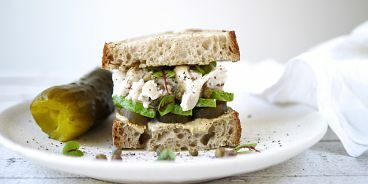 Toast your bread and assemble your sammy by brushing one side with remaining dijon and drizzling the other side lightly with oil and vinegar. Layer on pickles, avocado, vegan tuna salad and micro-greens. *I found my jackfruit at Tin Lee Market on E. Georgia St in Chinatown. A few other smaller Chinatown Markets have it, too, like Sunrise Market. If you find a source that sells the jackfruit in brine or water (and not syrup, let me know and I’ll add it to this note!) PS – many of these markets only accept cash FYI.